April is designated as Volunteer Month, and as the community shelter for 21 municipalities in southern New Jersey, we are grateful for the many helping hands that have cared for our animals since our inception in 1988. Each volunteer has made a lasting impact on what VAO is today. Motivated by passion and a deep devotion to animals, these individuals make all the difference in the lives of our cats and dogs. A prime example is Atco resident Denise Delaney who works as a manager of administrative services for an insurance brokerage firm. Her love for animals is what brought her to VAO, nearly 20 years ago. 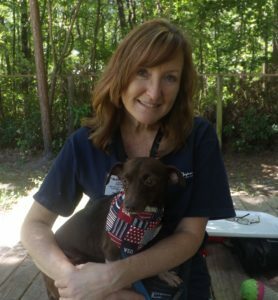 “I wanted to help homeless animals find a loving home, but I only wanted to work at a shelter where I knew they put the animals first, and that’s VAO. I could not volunteer with a more caring group of people,” says Denise. At VAO, the staff and volunteers care for approximately 150 animals on any given day. Socializing with animals is key to their mental well-being, whether it’s taking the dogs for a walk, playing fetch or cuddling and petting a cat. “Each second spent with the animal means the world to them. When you see an animal looking at you, there’s a bond there. If you’re an animal lover, you know exactly what I mean,” adds Denise. Of course, the main goal of the staff and volunteers is to help find the animals a forever home. Denise is no stranger to the adoption process – she has adopted five animals from VAO since she began volunteering there. Not all animals are so lucky to have found such a loving home, which is why volunteering at VAO means so much to Denise. At VAO, the staff and volunteers are dedicated to providing a positive experience for the animals. That’s why the orphanage recently launched their capital campaign, “Building for a Pawsitive Future,” to raise money for a new facility. The new building will feature much-needed upgrades to provide VAO’s “temporary residents” with loving care and attention until they are placed into their forever homes. However, in Denise’s mind, the new facility isn’t what will set VAO apart from other shelters.